I am always on the lookout for a way to save time making dinner. I have tried my hand at making freezer meals or using my slow cooker every night. Those ideas really work for other people but just never quite worked for me. I didn’t love the freezer meals and I have one (or two, ahem) picky eaters in the family. I needed something in-between. Something between freedom and failure. All or nothing wasn’t cutting it. So somewhere between the Land of No Meal Prep and the Land of Meal Completely Done, the freezer pack was born. I’m sure there is a better, more official name out there. But freezer pack works for me. 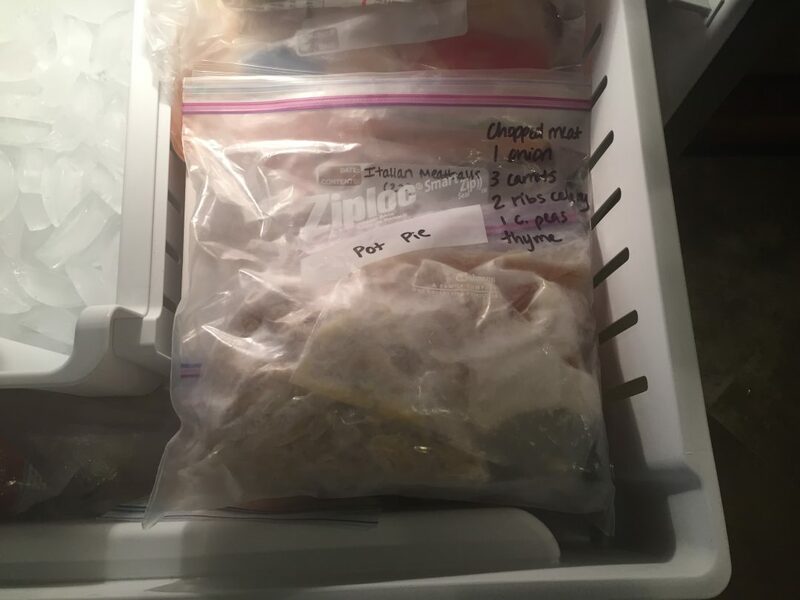 Basically, I have completed SOME meal prep and then frozen it. When I take the freezer pack out, my prep time is much, much less. The easiest freezer packs are probably something you already do. Do you buy meat and form hamburger patties to freeze? Yep, that’s a freezer pack. Make a marinade and drop chicken into it to freeze for later? Yep, freezer pack. Chances are, you are already making basic freezer packs. And boy do they work! Would you rather grill burgers from a freezer pack or try to form a frozen pound of meat into burgers? That’s what makes them so great! They significantly reduce the amount of time I spend making dinner. I make a lot of dinner. From scratch. Most days. And I also cook for others. Lots and lots of cooking. So any way to reduce that time saves my sanity. And grocery budget. We have already discussed easy freezer packs. Now let’s take your freezer pack to the next level. If you haven’t already, check out my Italian meatball hoagie post. 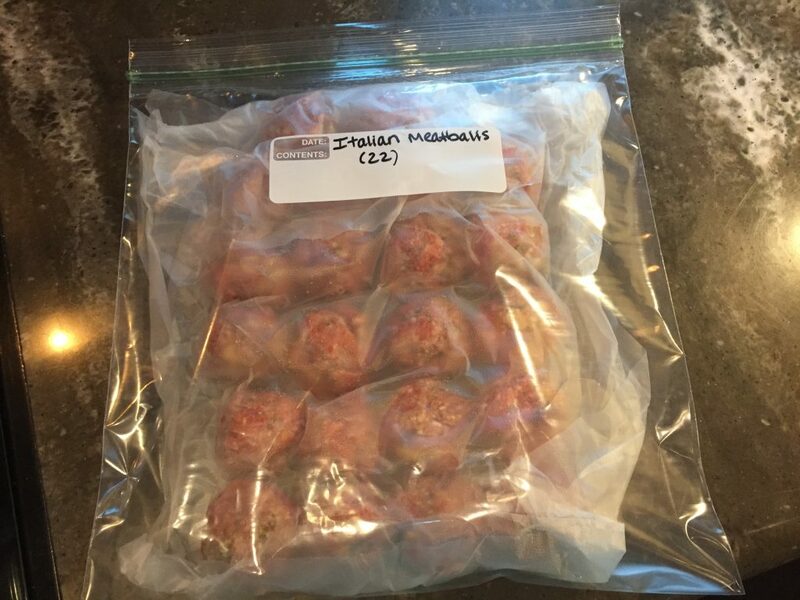 In that recipe, I split the meatballs into two portions and put one portion in a freezer pack for later. You can also get really creative with this. Maybe your husband loves this sandwich and you don’t. Use Press ‘n Seal to make rows of meatballs for each sandwich (if he likes 5 meatballs on his sandwich, then make them into rows of 5). Make sure to leave space between your rows and seal between rows. Then you can easily cut off one row at a time from your freezer pack, brown the meatballs and use homemade sauce – or any spaghetti sauce – to make a quick, but homemade sandwich. That is your freezer working for you! This trick is especially helpful if the number of people you are serving can fluctuate a lot. Some nights, it is just dinner for me and my husband. Other nights my kids are here with their friends. Or I need to take a meal to a potluck. By freezing whole or half batches, I can make a family size batch or larger. I can even make that one sandwich. I also like to freeze sausage balls. Not the kind you eat at Christmas, but the kind I use in my Sweet and Sour Meatball dinner. These do not have any Italian seasoning at all and taste quite different from the recipe above. I love homemade soup but not the dicing and chopping. I’m not very quick at it. I like to be precise (the baker in me) and I don’t like to be rushed. Not great for a quick bowl of soup. My picky eater doesn’t like soup at all. All that unidentified, scary stuff floating in liquid! After much (painful) trial and error, I finally found a soup he likes. Ham and Potato Soup. Hallelujah! I like to keep a freezer pack *going* at all times for this soup. Going? What do I mean by going? Here is the other big tip! Ready? You don’t have to complete the freezer pack for it to help you. Especially with soups, cutting the onion and putting it in the bag will not only save you time (and tears) down the road, it will also save you if you are out of onions. Very often I buy celery. For one recipe. I buy the cheapest kind – with the tops on – and I have plenty left over. At this point, I will chop the remaining celery and place into various freezer packs – usually soup and pot pie. I do not freeze the celery in one large chunk of unidentifiable green. It will never serve me that way. I have the amount needed in the recipe written on the bag and I put the correct amount in for that recipe. If my ham and potato soup needs chopped ham, onion and celery, I might have all of that prepared or just a few of those items chopped. Either way, it is a head start on dinner. It’s also great for using up leftovers instead of throwing them away. You can easily put aside a cup of chopped ham when you made a whole ham on Sunday. This is a way of using those leftovers to maximum advantage. Not just a cup of ham but part of an entire pot of soup. Way more satisfying than leftovers. Maybe this seems like waaaaaay too much bother, and if it does, then stick with what works for you. But on the other hand, maybe as you read these hints, the light is beginning to dawn. No more throwing away nasty, slimy produce. Now you are creating new meals with leftovers! No more running to the store for an onion before you can start the recipe! Lots and lots more homemade meals – even ones with sizable prep lists are within your grasp! I like to slow cook chicken on the bone and this is where I use my extra meat. Just a year or so ago, I found an amazing recipe for pot pie. My family and friends loved it, however, the ingredient list was long, the prep was long and so it got added to my freezer packs. If you want the recipe, don’t worry! I am making it this week as part of my clean-out-the-freezer week. One last tip since grilling season is upon us! When freezing hamburger patties, steak and chicken for the grill, make smaller packages. I do love my Press ‘n Seal – and no – they aren’t paying me anything to say that! I ideally like to freeze items individually by just sealing between items. Then when we grill, we can make 4 burgers, 2 pieces of chicken and 1 steak. Easy peasy. If you have questions about freezer packs, please comment below!